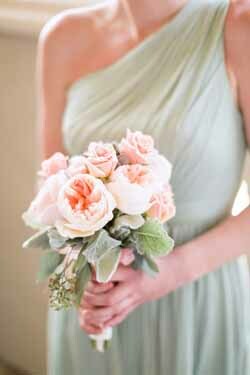 Spring and Summer are two of the most popular seasons to say ‘We Do’. Is it any wonder? 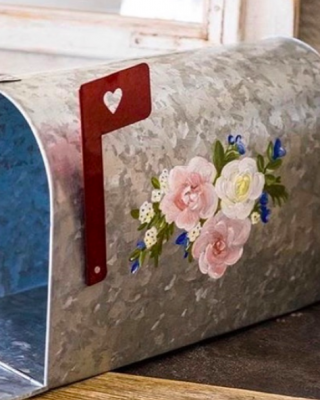 You’re graced with glorious sunshine, beautiful blooms and heaps of gorgeous colour palettes. 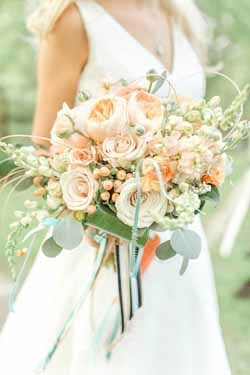 Today we’re swooning over a truly delightful colour scheme that would work for a Spring or a Summer wedding. 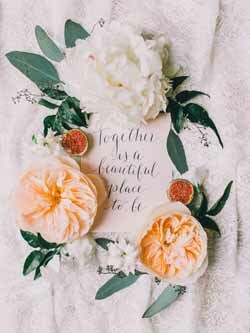 Take a look at our favourite ivory, peach and wild foliage wedding ideas. 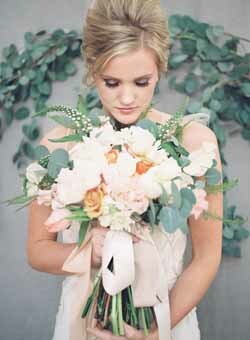 When I think of a Spring or Summer wedding, I think a focus on beautiful blooms is an absolute essential. 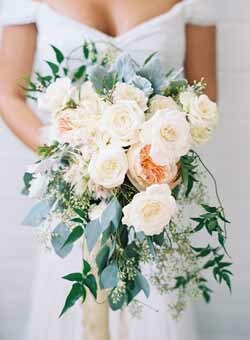 From pillow-soft peonies, ivory roses and wild foliage, you can effortlessly create the most breathtaking wedding bouquet. We love the thought of using flowers and rambling greenery throughout your wedding day. 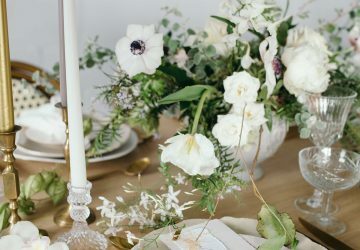 From flower crowns to table centrepieces, your wedding flowers will help to tie in your colour scheme. 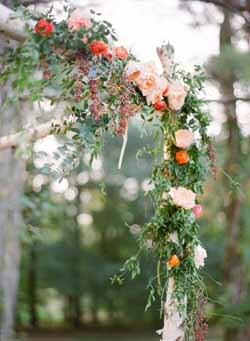 Creative ceremony spaces are incredibly on-trend for future weddings, so why not create a wooden archway adorned with your favourite flowers? 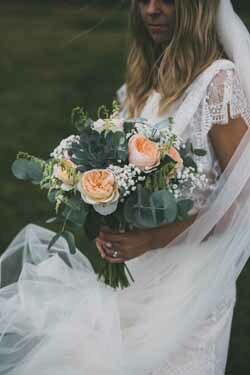 Opt for ivory, peach and wild foliage wedding flowers – you could even add in peach silk ribbon for an extra sprinkling of magic. 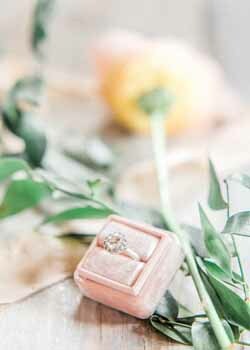 It will create a really special place for you to tie the knot, and it will help to make your ceremony room completely unique to your wedding day. 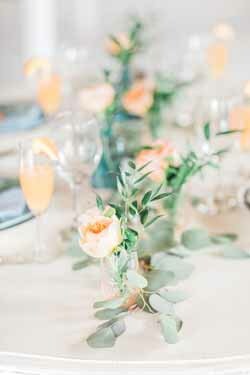 An ivory, peach and wild foliage wedding colour palette lends lots of options for your table décor. 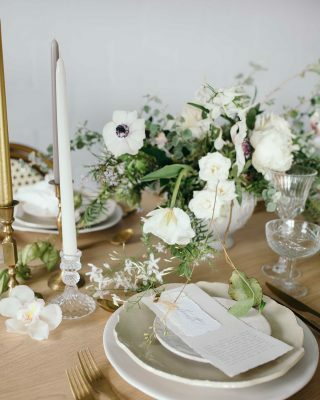 Add a hint of glamour by filling a golden vase with flowers and foliage, teamed with a linen table runner. 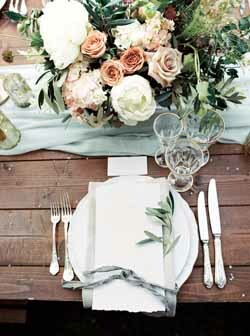 You could mix and match your wedding tables by using a variety of peach, ivory, grey and pale green table runners. 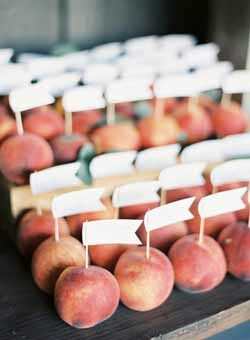 Dress your wedding place settings with a simple ivory napkin tied with a peach ribbon and a sprig of greenery. 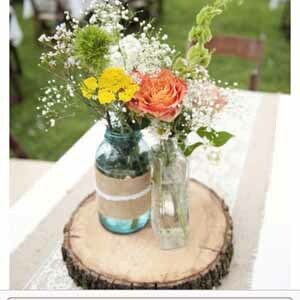 Eucalyptus or sprigs of Olive tree look absolutely gorgeous and can add a rustic touch to your wedding tables. 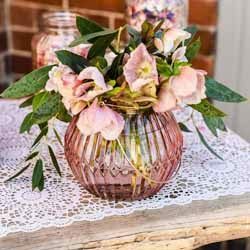 If you like the minimalist look, you could keep your table décor simple and sweet by placing a single peach posy in a clear glass vase. 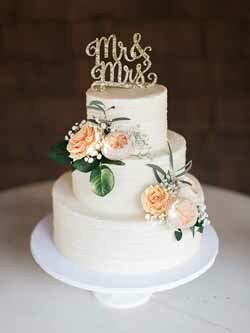 An ivory wedding cake topped with elaborate peach sugared petals will look so scrumptious. 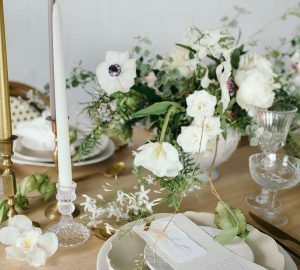 Fortunately, this heavenly colour palette will suit any theme so you could use a rustic tree slice or a gold cake stand to display your masterpiece. 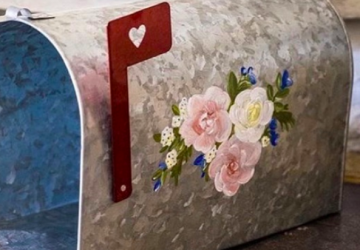 The colour combination is truly versatile, so the choice is yours! Speaking of wedding cakes, we’re huge fans of delicious wedding dessert tables here at The Wedding of my Dreams. You could create a food or drink station with glass drink dispensers filled with peach flavoured cocktails. Serve alongside our peach straws and mason jars for a nod towards the season. Bowls full of peaches are a must-have! 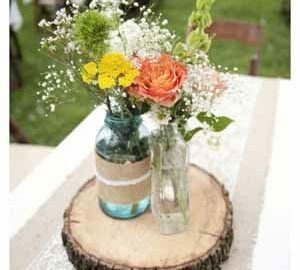 Jars of cookies, cupcakes and macaroons will also be appreciated by your wedding guests. 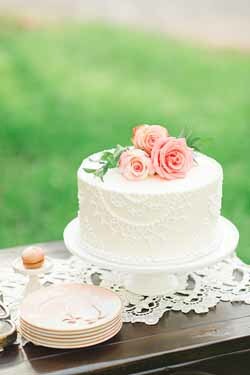 A wedding dessert table or drink station will be such a fun touch! 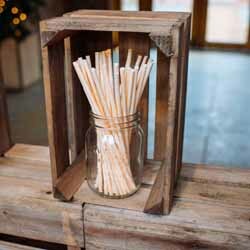 Have you seen our Spring wedding drink station ideas? 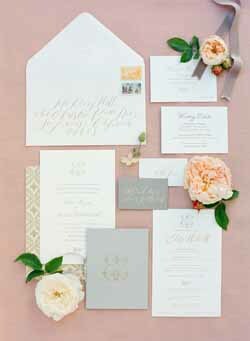 An ivory, peach and wild foliage wedding theme is a wonderful choice for a Spring or Summer wedding!